I have seen quite a few versions of these mason jar welcome signs and decided to make one. I started off with a piece of reclaimed barn wood that we had left over from building our log cabin. I cut the board to the size I wanted and gave it a light sanding to remove any loose pieces and sharp edges. Then I brushed it off with an old toothbrush to remove any loose particles and dust before painting it. 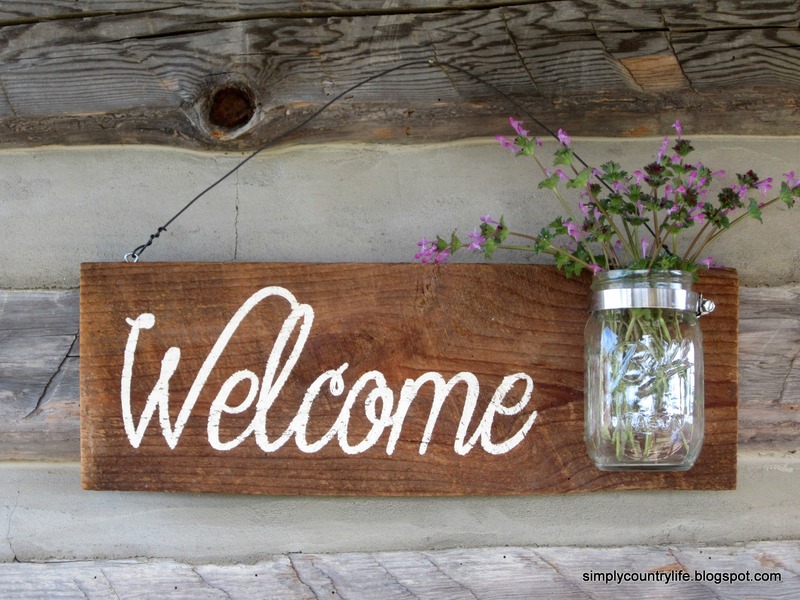 I used my Silhouette Cameo to make a vinyl stencil to help me paint the word WELCOME onto the board. Don't worry if you do not have a Silhouette. There are plenty of ways to do this by hand. Of course if you are really good, you can freehand paint it or if you are like me and freehand isn't your specialty, you can try the method I used here. After the paint was dry, I lightly sanded over it to give it a worn, distressed look. Then I added two eyelet rings to the top of the board and a rusty wire to hang it with. I also sprayed the sign with a clear matte protective finish before adding the mason jar clamp. I used a pipe clamp, that you can purchase at any home improvement store to attach the mason jar. Just screw the clamp to the wood, then insert your jar of choice and tighten the clamp onto the jar. The jar can be easily removed and replaced when you want to freshen up your flowers. That's it. Now it's time to find pretty spring blooms to add to the jar. I'm seriously wanting to steal some forsythia from one of my neighbors yards, but I'm a chicken. I think the bright yellow blooms would look so pretty against the rustic wood. Hopefully I'll see one of them outside later today and I can ask if I can have a few sprigs. Last summer I did another fun project using these pipe clamps. You can see it here. I hope you have a wonderful day and thank you so much for spending part of it here. I hope your week is going great Sherri! Love it! I attached a jar using this method for a spare change jar. Love the idea of using it for flowers! Thank you so much Cecilia! So many possibilities! 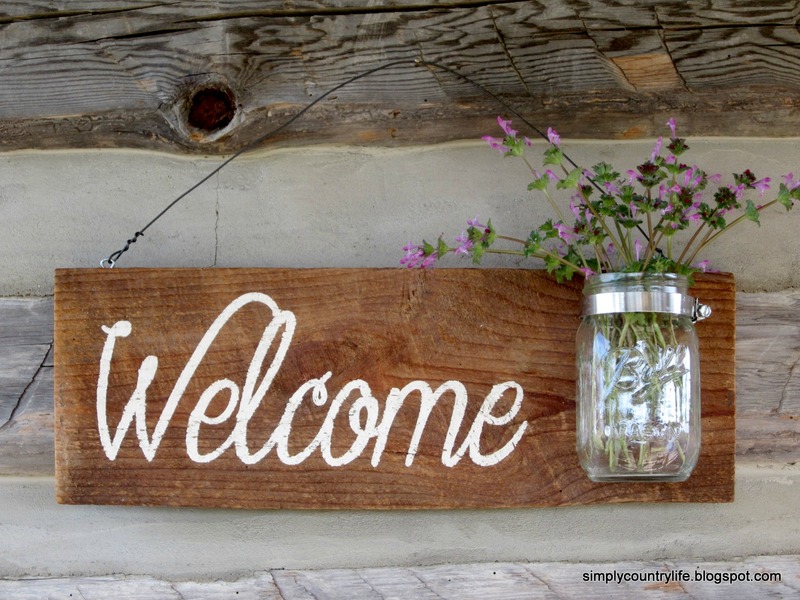 I love your simple barn wood welcome sign. Thanks for sharing at Catch as Catch Can--catching you! Awe, thank you Gail. I'm excited to be caught with so many other great projects! does it not hang off balance with the jar at the one end, even if empty?